Anybody else struggling to create value that people pay for? Every business owner, worth one's salt, knows you don't get PAID --if you bring NO VALUE. Even though, the salesy characters look at the dollar signs before they figure out how to improve someone's life. That's reverse engineering all backward. Think about the biggest tech companies in the world: Apple, Facebook and Microsoft they're always innovating how they do things. They disassemble the problem and put together a solution that either reduces or eliminates it. The only way they can stay in business and make millions is if we keep buying their products. If there were no use for portable music, page creeping family and friends or a software that helps you write contracts --their business would cease to exist. NOW, your business needs to flaunt how you help or risk losing your invitation in the mail. Money is exchanged only when a person perceives something as valuable, not because it's sitting in the bargain bin. How you price your product, says something about your product. And so do the people who may be in buying-from-you limbo "It's so cheap, it can't possibly work?" questions, your client. Underpricing yourself sets you up for failure. They either don't expect much or they expect too much. In both situations, you lose. Pro Tip: Make irresistible offers by adding bonuses and exclusivity in lieu of a low price point. This is a bit of an oxymoron after the last point but it's kinda like when the government gave me back $2.35 on my Tax Refund. Providing something for free is a gateway drug to working with you. You get to showcase your skills and how you help. When some things are free you can easily create a WOW experience. "If this exceptional thing is free, just imagine what the paid version is like!" your client exclaims. Spotify does it. Many apps do it. The up-sell comes via in-app purchases and most likely if the free experience was phenomenal, you too, will eventually buy. Pro Tip: Lead magnets help you to collect emails and build up on the value allowing you to soft pitch in the future. 💡related: Should You Give Away Your Best Stuff For Free? We already knocked out low-ball pricing. So, you can't use that as a reason. Think deeper. Think more emotionally tied. How will your thing improve their life? What good feeling will arise? Did you cut time/cost/labour for them? SHOW them how their life will be better after purchasing from you. Pro Tip: Copywriting benefits 101. The instantaneous way of being valuable is to be in demand. Whether you need to change industries, specialize in a niche skill or create scarcity around your product. Your demand goes up -- when the supply goes short. Find a space where you can manufacture demand. If everyone is marketing online, go offline. If everyone is selling "DIY" courses, sell "I'll Do It For You" packages. If everyone is a YouTube Star, become Podcast Famous. Pro Tip: Be deliberate in your selling advantage. Would you buy your thing? Do you really believe it will improve someone's life? Do think whoever doesn't have it must be suffering? You must believe so hard in your thing, it pains you to think people don't have it in their possession right now. When you feel this deeply --it switches from salesy to sharing a cure. You wouldn't keep a cure to yourself, would you? Pro Tip: Commit to sharing raving testimonials and real case studies of your service/product. 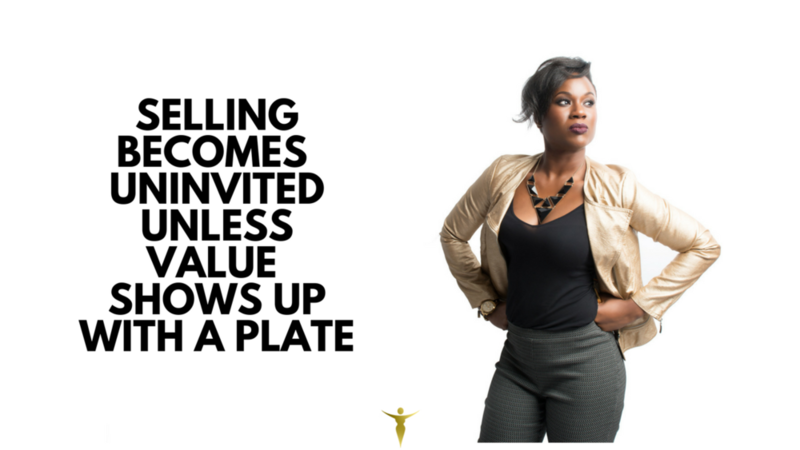 This value you struggle to bring to the table is the biggest selling advantage you got --unless you bring the whole table.